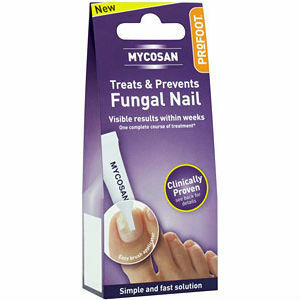 Mycosan is an all-inclusive product which is made to treat light forms of fungal nails, protect healthy nails against fungus, and care for the treated nail. It is manufactured by the company Profoot (UK). It states it has a short but effective treatment which is dermatologically tested and odor-free. Mycosan comes in bright purple packaging; the box contains a squeeze tube with brush attached to make application of the product easy, as well as 10 nail files for single use. Mycosan claims that results can be seen within a few weeks. I was interested in whether or not Mycosan lived up to these bold claims and did some research further into the product. Mycosan claims to have a patented formula with a bio-active substance that works to treat fungus deep in the nail; however, I could not find a detailed ingredient list anywhere on this website or any other on the internet. The website recommends that Mycosan should be applied twice daily on any affected nails for an uninterrupted period of at least 4 weeks. The product should be left to dry for at least 1 minute. After 2 weeks of using Mycosan users should start filing the affected nails carefully once a week. The website advises continuing with the daily treatment until the nail regains a healthy, normal color which may take some months; however, first results should be visible after a couple of weeks. Mycosan was not available for purchase directly on the website but directed me to wellbury.co.uk, where it retailed at the special price of £16.99 or approximately $23.36 for one package with a 4 ml tube. The website states that a 4 ml tube should be at least sufficient for treatment of the large toenail. The website offered no guarantees for Mycosan, but it did have a list of 3 testimonials from customers who purchased the product on Amazon.com. Amazon.com revealed that the product had a 4/5 star review from 12 customers. Strangely, the Amazon.com page was for a product sounding very similar to Mycosan but actually had the name ClearFeet; the product was currently unavailable to be purchased. Perhaps at some time in the past ClearFeet re-branded into Mycosan, but I am not sure. Mycosan offers a product at a decent price with reasonably good reviews. Unfortunately, the website did not list the ingredients despite multiple claims at a special, patented combination formula with a bio-active ingredient. This is somewhat worrisome for anyone considering buying the product, as general buyers would like to know what a treatment contains before using it on their body. Also, all of the reviews for Mycosan are actually for a product named ClearFeet, which sounds very similar to Mycosan but we’re unsure whether or not they are the same product. Jack Stevens	reviewed Mycosan	on May 8th	 and gave it a rating of 3.